And now, the moment we've all been waiting for! 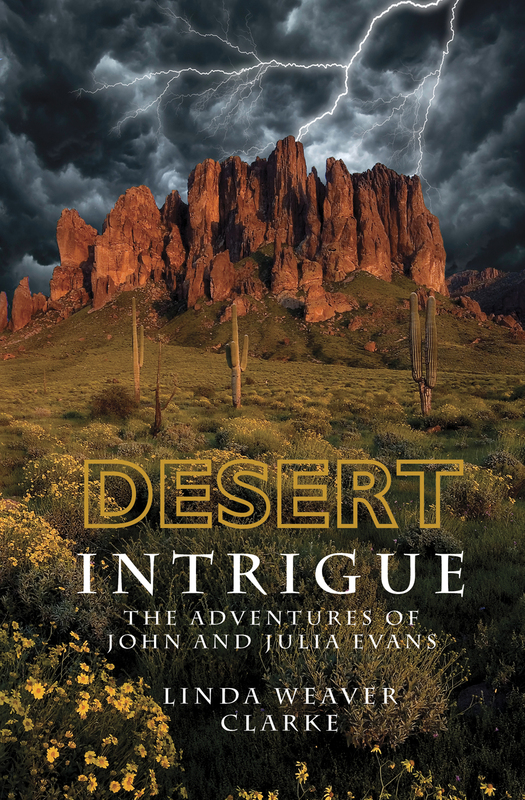 The lucky, randomly chosen winner of Desert Intrigue by Linda Weaver Clarke is Cheryl (who has many blogs). If you didn't win this time, please check the right side of my blog for other giveaways (if you're on a mobile device, you'll need to switch to the web version to view them). Please join me and congratulate Cheryl. I've mentioned Cool Text before, but as I've just used it to design the graphic above, I thought it deserved a fresh "shout out". This graphics generator, which has been recently updated, allows you to create your own fabulous, free graphics for your blog or website. I've designed various graphics for my blog using it. I keep a small logo on my blog as a "thank you", and as a quick way to get to the site. It's super easy to use, and gives you countless design choices. I hope this doesn't sound too "adsy". While I try to sell a few books through my Amazon links, I try not to play the part of the pushy salesperson. However, I'm absolutely thrilled with my new IKEA Produkt Milk Frother, which is made by IKEA but sold on Amazon (at a real steal of a price, only 99¢ plus $4.99 shipping). Although it was kind of tricky to get the batteries into the small compartment, it works really well, especially compared to my old frother, which was broken but worked if I held it together in a very awkward fashion. I'm loving my new little appliance, using it to froth milk to pour on top of my hot coffee, giving it some oomph and a shot of calcium. This is my own version of a "latte", which is, according to Wikipedia, from the Italian caffè latte or caffellatte, a coffee drink made with espresso and steamed milk or soy milk (I want to try to froth soy or even coconut milk). 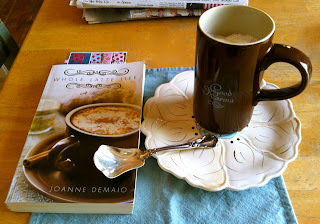 The inspiration for finally getting a new frother was the book Whole Latte Life by Joanne DeMaio, which I'm currently reading (please stay tuned for my upcoming review). Books sometimes influence me in little ways like this. What about you? Great post Suko! Congrats to the book winner. I've just recently discovered IKEA and I loved the place. I got my kids beds there and during our shopping trip we ate in the cafeteria, they have good food and yummy desserts. Glad you like the frother, it sounds great. Happy reading, I like how you've displayed the book with your drink. I look forward to your review. Thank you, Naida. I also love IKEA--they have some great stuff! I will post my book review in a few days. Thanks for the giveaway. I'm very excited. You're very welcome. Enjoy the book! Congratulations to the Cheryl! I hope she enjoys the book! The frother looks like a good item to have. Alas, I have given up coffee (for now) and will miss those lattes! I didn't know Ikea sold stuff on Amazon .. that may be dangerous for me to know!! I don't know if I can say a book has ever influenced me BUT there have certainly been several which have got me thinking about my life and the universe. You mean I don't have to haul out the espresso machine every time I want to froth milk? Now I want one of those. Much safer, and less costly, to order from IKEA online than to go into the store! I just finished reading Whole Latte Life and that cover was giving me coffee cravings the entire time. Oh.. and Congrats to your winner. Exactly! Of course, I'm referring to the coffee cravings. Thanks for your comment, Leslie. I love a good latte or a coffee...anything like that! I hadn't heard of one of these before but I'm definitely intrigued so thanks for sharing! On www.txt2pic.com you can make more logos (and funny pics) online with your text. www.Gimp.org has a free PC image editor similar to Adobe PhotoShop.